This is something that I threw together one Sunday morning brunch because we had some oysters on hand, creamed spinach and fresh salsa. It is a baked whole-wheat wrap shell with a bed of creamed spinach topped with stewed oysters and then delicately poached eggs, then topped with a Beurre blanc sauce and a side of fresh chunky salsa with home fried new potatoes and garnished with chopped green onions. I named this dish after a small town in New Mexico that sits just north of Santa Fe and below Taos, nothing special there, just a small town with a great name…hence the salsa. 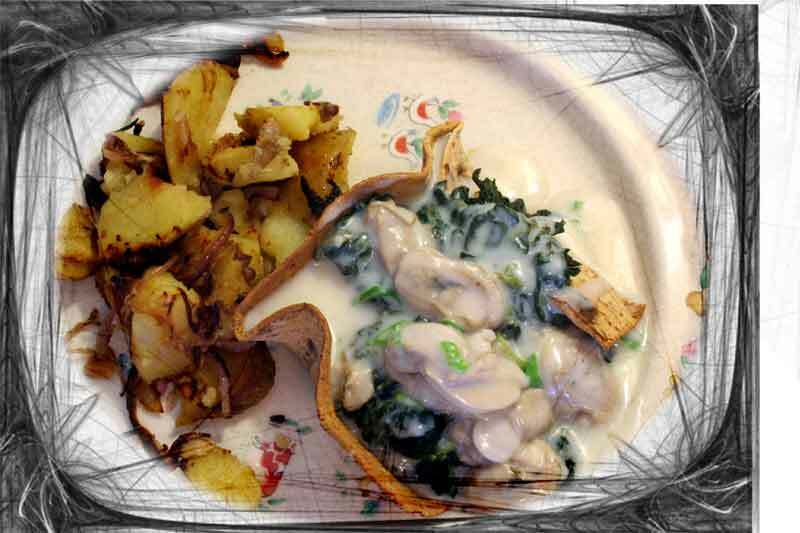 This first image on the left shows the shell with creamed spinach and oysters, and with the side potatoes. Click on the image(s) for a larger view. I suppose that a formal recipe could be written here, but this is just a variation on a theme. Poached eggs being the main event here, and really are quite easy to prepare, with a few tricks of the trade…that I will be happy to share. A shallow sided saucepan works well for poaching eggs, or one that has a large broad flat surface area and at least a 3-inch wall straight up. Fill the pan about ½ way with cool filtered tap water. Then add about 1 ½ cups of white vinegar, this is the little trick I was telling you about, the vinegar helps the eggs to stay together and coagulate quickly. Otherwise, the eggs would spread out and be hard to stay together. 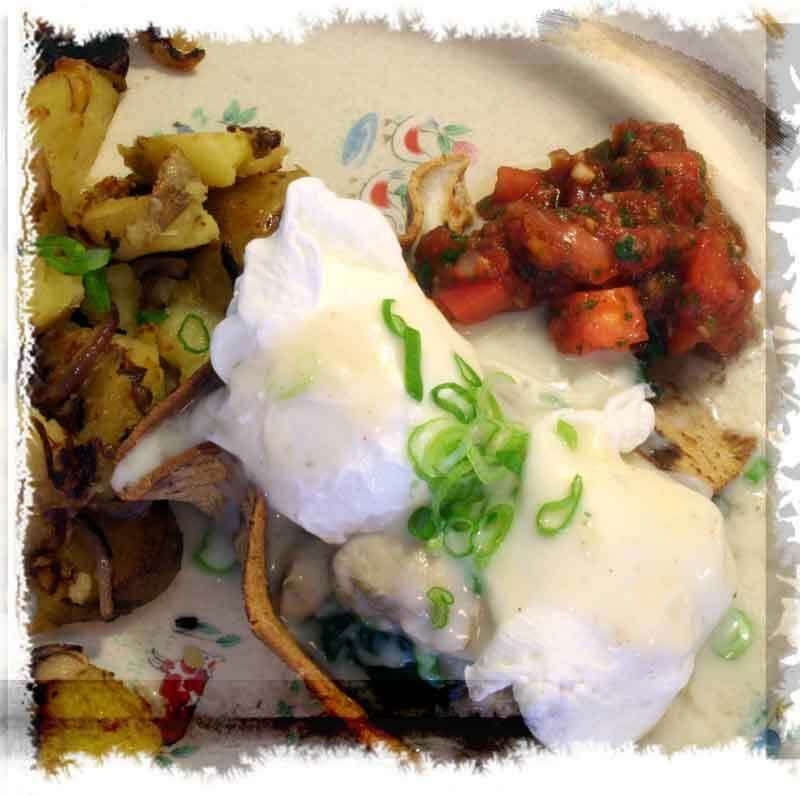 The image on the right shows the poached eggs, salsa, sauce and garnish added to the base Florentine, oysters and shell. Over a medium-high heat bring the liquid to a very slow simmer, you want tiny little air bubbles to form on the bottom surface of the pan. When the water is hot enough gently crack up to 6 or 8 eggs into the warm water, then using a slotted spoon gently push the eggs a slight bit to ensure they will not stick together or to the bottom or sides of the pan. Continue to poach the eggs until the desired doneness, timing varies here so be sure to use the slotted spoon and lift one of the first ones out and gently press it with your thumb or forefinger to check. If you like the yolks runny then less time is required, on the other hand if you like your yolks hard then more poaching is required. Practice makes for perfect poached eggs; I cannot remember how many I have poached in my day. I finally learned to poach an egg this year and now I can’t stop! This is such an original combination of ingredients that would work really nicely with a perfectly poached egg. I miss eating eggs! I think poaching them was the best! These poached eggs sound so good with oysters and spinach! What an interesting, tasty brunch dish! I’m a big fan of poached eggs, and exceedingly glad I have acquired the poaching skill. Very easy once you get the hang of it, as long as you don’t get distracted while they’re poaching away! I have never poached an egg yet that is my favorite way to order them in restaurants. Love the combo of spinach with it. delicious! change the poached egg to a duck egg and i am sooo there! must be nice! … JUST had some oysters around! kinda like i just have some cheap canned tuna around? haha! What interesting things you have leftover in your fridge and what a wonderfully creative and delicious way to utilize them! I’ll be over for bruch next Sunday! very luxurious sunday breakfast with oyster! seems pretty easy to come up with too. love the poached eggs to go with it. Yum, poached eggs over anything is fab! Agreed with the vinegar, although my technique with poaching needs improvement. Everything on this dish is a home run! My husband would LOVE this dish – he is a poaching fiend and he adores oysters. Yum! Hi! This is a wonderful, complete breakfast! Looks really delicious too! Amazing use of the oysters and spinach, which reminds me of oysters rockefeller. No doubt the Beurre blanc sauce adds interesting complexity. Thanks for the ideas. Wow, oyster for breakfast! What a luxurious breakfast and the poarchd eggs look just perfectly well done. Ok. I must make this one Sunday brunch. I love poached eggs with anything! Lovely brunch, love oysters too. I am catering a brunch for 35. How would do you recommend poaching about 5 dozen eggs? I don’t have a tilting skillet, and I was planning on poaching a day before and warming them at service. Do you have a large brazing pan maybe? Any large but short walled pan would do for poaching large quantities of eggs. Even a 4-inch tall chafing dish insert would work. When poaching ahead of time we would set up an ice bath of chilled water to drop the poached eggs into so that they would stop cooking quickly, as in the blanch and chill method. Then keep them in the cool water for overnight storage.